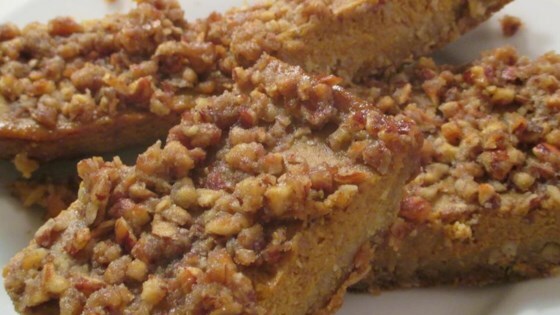 "This recipe includes an oatmeal crust, pumpkin custard and a chopped nut topping." Preheat oven to 350 degrees F (175 degrees C). Spray or grease one 9x13 inch pan. Mix together the flour, oatmeal, brown sugar and butter or margarine. Press into pan; bake for 20 minutes or until golden brown. In a large deep metal bowl, beat egg whites until soft peaks form. Blend together the pumpkin, evaporated milk, egg whites, sugar, salt, cinnamon, ginger and clove. Pour custard into baked crust; bake for 30 minutes or until firm. Mix together the chopped nuts, brown sugar and butter. Sprinkle topping on custard and bake additional 15 minutes. Remove from oven and allow to cool. Cut into squares and top with whipped cream if desired. I'm not a huge pumpkin fan but I still liked these. They were a big hit at work.